Anna Ruth Naugher is 75 years old today, born in 1936 Anna is Tara and Calum's Grandaunt. Ann married Coy Maxey October 26, 1956 and begot Michael Coy Maxey in 1959 and Cathy Joy Maxey in 1961. They are Tara and Calum's 1st cousin once removed. 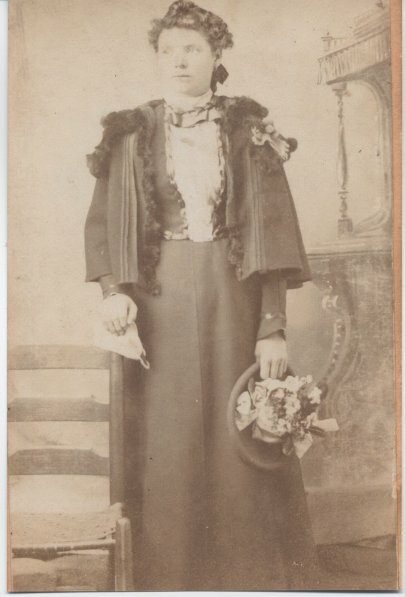 Anna is the 7th of 9 children to Horace Savage Naugher and Maxie Ruth Smith. Their first child is Moses S. Naugher Tara's Grandfather and the father of Connie Sue, Brent Stewart, and Rhonda Lea Naugher. Baby Lane died 111 years ago today in 1900 at age 13 days. Baby Lane the kids' 2nd great-grandaunt, was born on January 3rd and died on the 16th. She is buried in Tuckers Chapel Cemetery. She was the 3rd of 4 children that Dawson B. Lane and Lucy E. Burnett had. William N. Lane (abt1897- ), Budgut K. Lane (abt 1898- ), Baby Lane (1900-1900) and Maggie May Lane (1901-1902). These of course are 1/2 relations. Lucy E. Burnett is the former Lucy E. Meyer the kids' 3rd great-grandmother. Benjamin Harrison Barnett died 42 years ago today in 1969 at the age of 84. Benjamin is the kids' 1st cousin 7 times removed. His father is Benjamin Johnson Barnett, the brother of 6th great-grandfather, David Barnett (1776-1861). David married Sarah Phillips in Oglethorpe on April 7, 1791 and they begot 9 children. The 8th born was Abel M. Barnett in 1813. Abel married Rachel Meadows January 11, 1832 and begot 9 children with David A. Barnett being the first born. David married Jane C. Fleeman December 8, 1857 in Oglethorpe and begot 7 children with Lucy Emline Barnett being the first born. Lucy married Dedrick Henry Meyer in 1875. Samuel Wilson Mayne died 117 years ago today in 1894 at age 68 in Van Zandt, Texas. Sam is the kids' 5th great-granduncle, the brother of William Homer Mayne, the kids' 5th great-grandfather. William married Martha and begot 8 children between 1840 and 1856. The 5th born was William Paul Mayne in 1849, the kids' 4th great-grandfather. William Paul married Ella Higgins November 28, 1874 and begot William Mitchell Mayne in 1878. William Mitchell married Ida Jane McMurrey December 31, 1899 in Cherokee county, Alabama. Bathsheba Austin Emmott died 148 years ago today in 1863 at age 80 in Stanford, McLean, Illinois, Bathsheba is the boys' 5th great-grandmother and the wife of John T. Stanford. Their youngest child of the 4 they had is Isaac Austin Stanford. I don't think we've been here before, so I will elaborate a little. Isaac Austin Stanford married Catherine Kneff on Oct 8th, 1835 in Tippecanoe, Indiana. Their Second child of the 12 they had is David Stanford. Daniel Banks died 172 years ago today in 1839 at age 99 in Fairfield, CT. Daniel is the boys' 2nd cousin 8 times removed. His mother is Mary Bradley their 1st cousin 9 times removed whose father is John Bradley, the boys' 8th great-granduncle and brother of Gershom Bradley the boys' 8th great-grandfather who married Sarah Sherwood and begot Sarah Bradley in 1744. Sarah is the wife of David Barlow II and they begot Anna Barlow who married Talcott Gold in 1782. Hubbard Cotton and Mary Hazelitt's 150th anniversary is today, married in 1861 when he was 22 and she was 24 years old. Hubbard and Mary are the boys' 3rd great-grandparents. They begot Samuel Hazelitt Cotton in 1862 who married Lotti B. Ray in 1887 and begot Marie Antoinette Cotton in 1891. Marie is the boys' great-grandmother. Edward McPhail Bridgforth is 105 years old today, born in 1906. Edward married Sudie Seay Bagley June 16, 1931 and are the Grandparents of Andrew Bagley Bridgforth and Bryan Wooden Bridgforth. Edward and Sudie begot Edward Jr. in 1935, William Bagley Bridgforth in 1938 and John Baskerville Bridgforth (Jack) in 1944. Jack married Deborah Ann Wooden in Dallas in 1982 and they begot Bryan and Andrew on April 5, 1983. All of that begetting makes Andrew and Bryan Steve Jr's 2nd cousins. Emery Paul Skelley and Judith May Reeves were married 52 years ago today in 1959 when she was 18 years old. Judith is Steve's grandaunt, sister of John Wesley Reeves, Jr. John married Mary Evelyn Pharris and are Steve's grandparents. Emery and Judith begot Jeffrey Skelley and Wesley Skelley and then divorced in 1967. Judith's second marriage was to Leonard "Pete" Carter McKee April 18, 1986 in Springfield, Robertson, Tennessee when Judith was 45 years old. John Henry Burt is 143 years old today, born in 1868 in DeKalb County, AL. John later died on July 12, 1935. John is Ella and Mason's 1st cousin 5 times removed and is married to Ella and Mason's 2nd great-grandaunt, Lillie Jane Hulgan. We talked about them yesterday.